‘We die and decay– or are burned– to come up again as wheat or roses, which in turn may form the bodies of future generations of people. Decay is the inevitable and necessary consequence of finite corporeal mortal life.’– Slightly morbid but beautiful quote of the day. Lots of school, lots of reading, lots of fun. A lot of hesitation, but my head throbs with the chilling promise of a new day, each day. So I could describe the entirety of my childhood in terms of cheesecake. It was definitely, undoubtedly, completely, a significant part of the reality I encased myself in. There was no such thing as no cheesecake twice a week, and yes, it did my soul a world of good, it was a chunk of my world and sometimes the world itself, when I didn’t feel like facing the real one. This was before I knew anything about the reality of the dairy industry, before I knew how much better it felt to put into myself a real damn cheesecake. A harmless, do-good cheesecake. So I was determined to make one. A proper one. A baked, New York-style cheesecake, soft, dense yet fluffy on the inside, firm and lightly browned everywhere else. They say anything made vegan is a compromise, which is true only if you’re not aware of what goes on in the food you enjoy on a day-to-day basis. Here is a cheesecake I made twice because I got so passionate about it. The ingredients are simple, the product flawless. Whilst meddling about experimenting with Minimalist Baker’s infamous recipe, I realised I could make the crust and filling, leave it in the fridge to set and then bake when I wanted it to (you don’t have to leave it in the fridge before baking though, I just did so due to time issues). Baking it together, without changing the temperature halfway, yielded an equally delicious and beautiful result. No hint of hubris. It’s just a good, dense, flavourful vegan cheesecake. 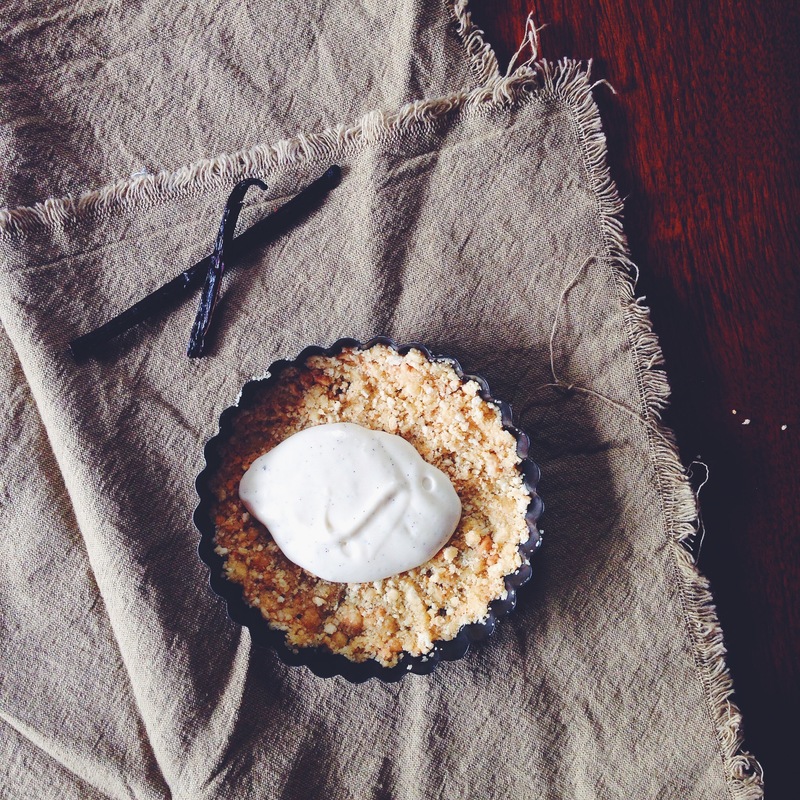 The night or day before you bake the cheesecake, put the cashews for the filling in a bowl and cover with water. Let soak overnight on your counter or in the fridge. You can also do this for half an hour if you have the time earlier on in the day. The next day, drain the soaked cashews and set aside. Preheat your oven to 170C and ready a 9-inch springform pan. In a food processor or blender, put in the ingredients for the crust and whizz it up until you can press the crust with your fingers and they stick a little. The crust should not be too oily to touch. Press this into a 9-inch springform pan and put it in the fridge to firm up a little while you make the filling. Briefly wipe down your blender/food processor (don’t go all out to clean here yet!) and whack in your filling ingredients, including the soaked cashews. Blend everything together until you get a smooth, white creamy product. There are usually still bits of cashews after blending for a minute, so continue to blend until everything is smooth and bit-less. Pour this on your crust and then bake for 50 minutes. Check at 50 minutes– the top should be lightly browned. If not, continue baking until you see a light golden colour on top. Remove, let cool on the counter for a half hour before moving it to the fridge to set a little more. Enjoy with some vegan whipped cream or coconut yoghurt. Beautiful on its own as well. 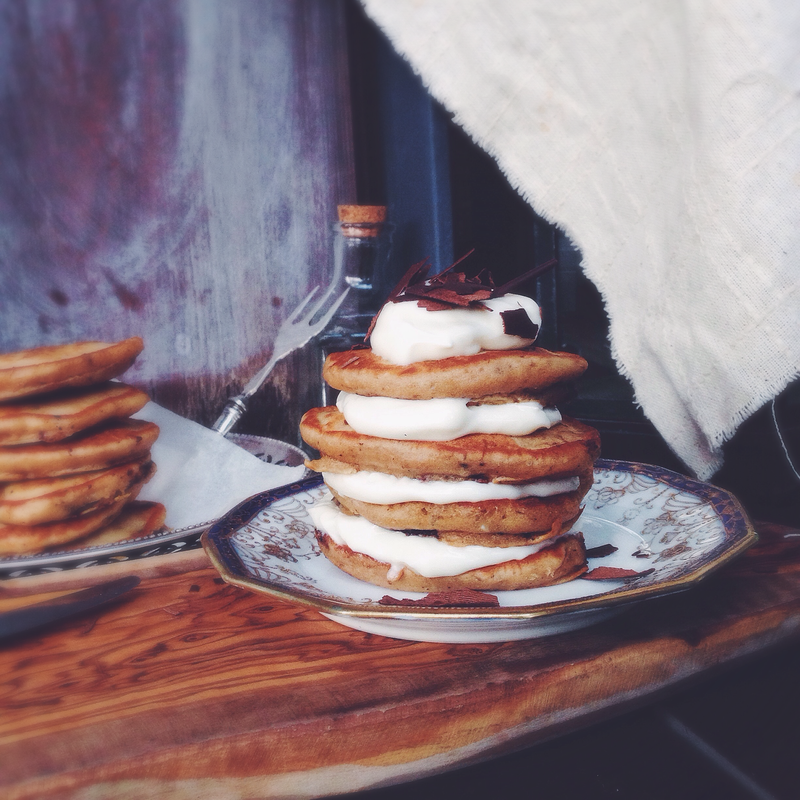 Dana did such a fantastic job with this recipe, and I’m dying for everyone else to try it! My favourite pairing is with berries and basil, as may be observed in the picture just above the recipe. Layers. That’s what was about the past week. Even if it did just mean reminiscing the gone, the forsaken, or somehow lost, there was a patter of layering, of some serendipity and will, that saw me through, and maybe saw so many through. In life there are inevitably some circumstances, not necessarily life-threatening, but still make for confusion, like how cutting my carrots much nearer the heads would mean pounds of carrots saved a year, or how there’s still this sad idea that gluten is bad for you because it creates gut permeability and thus allows for the infiltration of foreign substances and consequent inflammation, despite no hard scientific backing for this or the real relevance for us always-evolving-and-adapting human beings (perhaps you watched Clean Eating– The Dirty Truth as well, and know exactly what I’m talking about). There is always a tussle between loving reading about nutrition and creating things like this double-layered cheesecake, but that’s still what this blog will always be about– a joyous acceptance of conflict, this trust, that forms the greatest relief in this world of unknowing, guessing and playing. It’s a double-layered cheesecake. On the one hand that’s just it. On the other it’s got tahini weaved into its dense, firm, cheesy body, and the richest bottom layer of espresso, and I mean rich. To the point where you’re pretty grateful for the top, more normal bit, which still doesn’t scream total normalcy because of the tahini, the rich sesame paste doing much to enliven your normal dessert with a Mediterranean touch. I’m always constantly inspired by this young lady as well, who effortlessly incorporates such interesting flavours into her exotic new combinations and twists on classics! Espresso literally takes the cake here, and the process itself is quite the cakewalk, if I do say so myself. An easily put-together crust, a potent layer of espresso, a little of that aforementioned normalcy for the second layer, optionally topped with gingernut biscuits to enhance the spice and flavour in the body. Each bite is a two-toned wonder, nothing too magnificent, but still boasts so much to enjoy. The fact that this is a cheesecake pie ups the game a little, because it’s an excuse to not have all the sides perfectly covered with crust, there’s a lesser filling volume requirement, and both layers can be seen from top-down already, and I don’t know about you, but that made me all the more excited to tuck in when the time came. Preheat oven to 200C (400F) and prepare your cheesecake tin, preferably with a removable bottom. Mix ingredients for the crust, then press into the bottom using your fingers or the bottom of a cup. Bake this for 15 minutes, then remove to let cool for a while. While it’s baking, make the filling. To do so, mix together all ingredients for the filling except for the coffee concentrate or extract using a fork, in a large bowl. Split the mix in half, roughly or by weight, and add the coffee concentrate/extract to one. Mix well, then spread this half on top of the crust. Dollop the lighter layer on top and carefully spread that around, leaving a little border around the edges. Slice and serve! Feel free to top with melted chocolate, more tahini, and some gingernut biscuits for crunch. 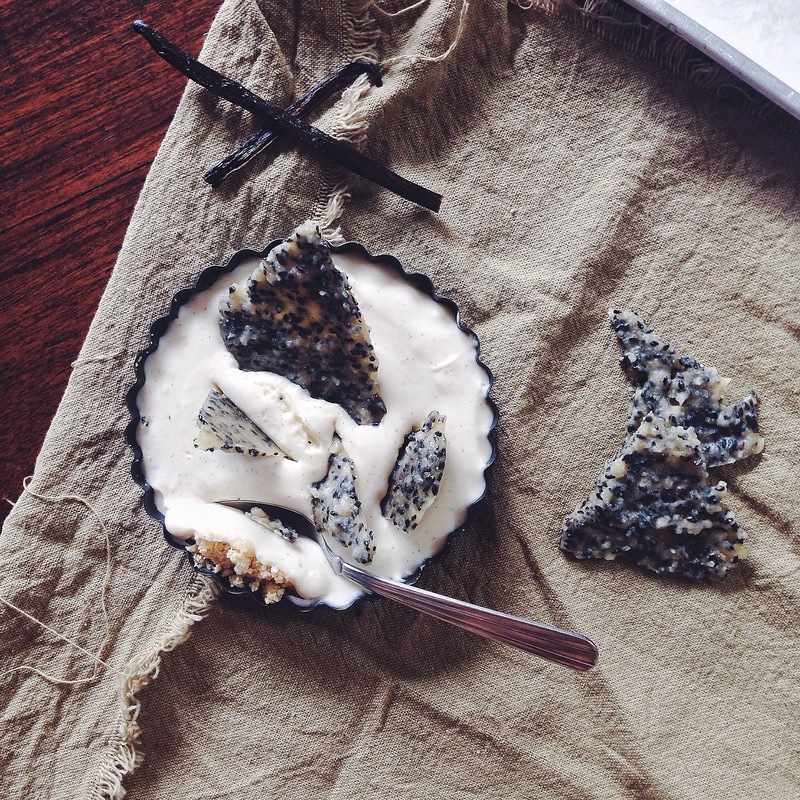 Sweet, tangy vanilla cheesecake with a crumbly crust, topped with shards of black sesame brittle. So much goodness in a 4-inch tart pan. The addition of black sesame? Almost unprecedented, perfect. A few days ago I had the pleasure of attacking a bought cheesecake in a jar, with a delightful crumbly crust, topped nicely with passionfruit. The first bite made me realise, and later lament, how much I adore cheesecake sometimes. It was my favourite sort of cake thing aged 5 upwards; hot, cold, plain or with something swirled in, I liked it all. The addiction pash waned a few years ago, but recent encounters with good, solid cheesecakes rekindled that familiar joy and pleasure. What I love about this is that it’s totally customisable, depending on the ingredients you have in stock. Save for the main component of cream cheese, of course. You see, the main base is cream cheese and icing sugar, but the ‘lightening’ components are needed for lift, volume and better distribution of flavours. Now these can be altered. I state whipped coconut cream as one component, but not many people have a can of coconut milk or cream lying around, so whipped cream (or whipped topping) would work just as well. A milder flavour suits the majority, too. And the vanilla bean? Well, life doesn’t end here. Vanilla extract would work as well, but if you’re the sort who doesn’t like to compromise on taste and scent, I strongly suggest going all out, and remember that these beans will always come in handy, for instance in your sugar and in a myriad desserts. 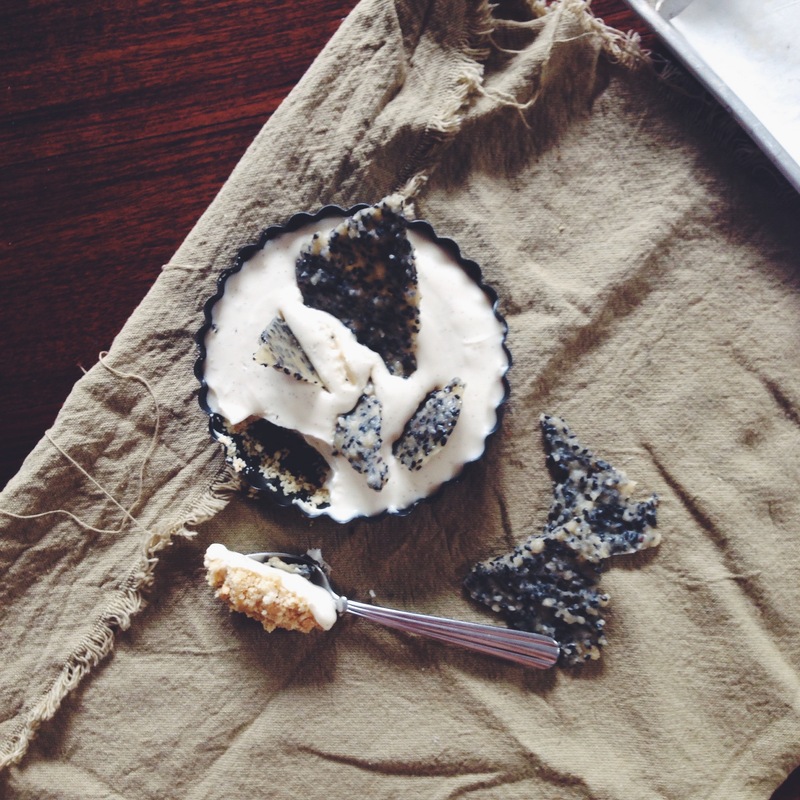 Vanilla bean and black sesame work like a dream together. The latter component is optional, but to spoon a bit of cheesecake onto a small shard of crisp, sweet brittle? Joie de vivre. The actual process of making the brittle isn’t half as hard as it sounds. I know, words like ‘brittle’ might as well be replaced with ‘croissant lamination’ or ‘flambée’. But the only hard thing about this is waiting, and perhaps spreading the brittle into a thin enough layer before it hardens completely. On a side note, things like sesame and flax have compounds called lignans which help to regulate metabolism and weight, and that’s always a plus, right? If you’re using coconut cream in your cheesecake base, then start prep the night before. Take a can of coconut milk/coconut cream (the label can be either) and place in the fridge overnight. The next morning you should have a thick, firm white cream. If you’re using normal whipped cream, whip up a batch the night before and let set in the fridge so it’s more stiff the next morning when ready to use. Place your biscuits in a small ziploc bag and zip the top tightly. Take a rolling pin and bash the biscuits until you get fine crumbs. Pour in the melted butter and incorporate well with your fingers (on the outside of the ziploc bag, of course). Pour into a small tart (should be 3-4 inches wide), or a small jar/cup, and press into an even layer with your fingers. 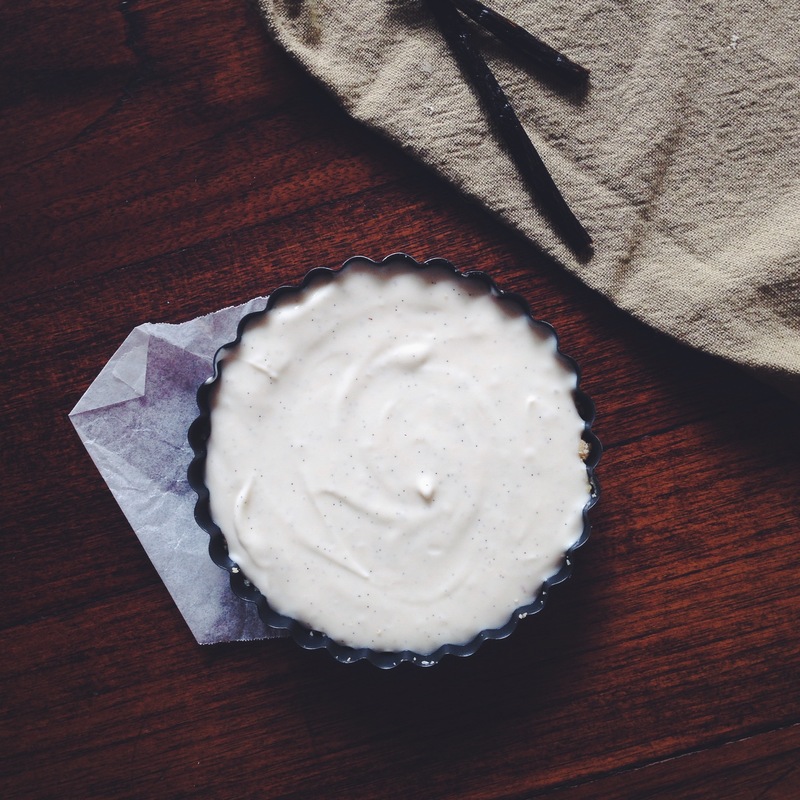 In a medium bowl and with a metal whisk, whisk together all the ingredients listed above needed for the cheesecake. The bowl needn’t be anything larger than medium since there’s not much volume to work with anyway (hoorah for a cheesecake all to yourself!!). Scrape the mix into your tart/jar/cup and place in the fridge to firm up. It’s ready for consumption in just 30 minutes, but you can eat it whenever. 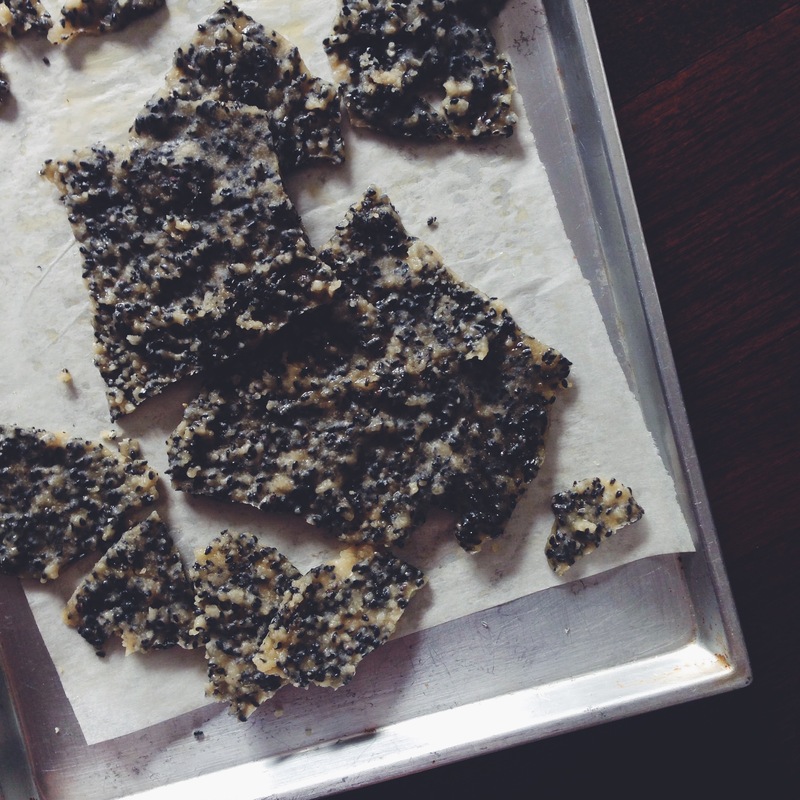 Black sesame brittle? Easier than it sounds. I based the recipe off Joanne Chang’s Flour recipe for cacao nib brittle, and though I would have preferred a thinner, lacier texture, this still worked fine by me and the rest of my family. Grease and line a large baking sheet and set aside (the top of the baking sheet should be well greased too). In a medium saucepan, add the sugar and water. Place on high heat and let come to a hard boil. Let the mixture continue to boil for 5-8 minutes, or until you get a light brown colour. At this point, pour in the black sesame seeds and swirl pan in a circular motion to distribute, or do so gently with a wooden spoon. Let mixture continue to boil until the colour deepens to a deeper, richer amber-gold colour. Then, whisk in the butter and salt. Take off the heat and pour onto the baking sheet and spread into a thin layer with a spatula or wooden spoon. Work quickly because the mixture hardens with time. A couple of minutes later you can break the layer of black sesame brittle into shards, or pieces as big or small as you like. Stick shards into the cheesecake and eat both components together. I like to spoon the cheesecake onto the sharp, sweet bits chockfull of black sesame seeds. YUM. There is a special eating method for this one, but you’re gonna have to scroll right down to the bottom to find out! Well. This morning. A coffee cup, orange juice glass and water glass. All empty. My father gulps it all down every morning, a robotic ritual. Like me, he’s a man of routine (yes I’m female but you get the point). I love how we both wake up early. I also love how I can ask him absolutely anything and he’ll probably know the answer, like what paraesthesia is or the difference between arthritis and gout. Anyways, it feels good to have settled into a workable routine, each day glistening with fun and possibility. It all sounds very childish but the good thing is that it’s all very true. Routine means allowing yourself time for everything without too much compromise, and I love early mornings when it’s just simple and quiet. Like Sundays with pancakes and the papers, instead of a meaningless spray of pixels on my phone or laptop. Just being, just living. All the Instagram posting, as much as I love this social media platform in all its filtered wonder, usually comes much later. But. I hate that part of the morning when my cup of coffee is done, is no longer young, and I want another, but ultimately I give up embarking on another 1-metre trek to the espresso machine because I know the jitters will come on just a tad too strong later on. I’m no weakling, but I am pretty sensitive (will usually wait till after lunch before I have another)! A while ago, I thought of making pancakes which incorporated just a little bit of coffee, because I still wanted my sisters to try them and wholeheartedly believe in their wondrousness. I thought of doing the whole coffee and chocolate thing because a little coffee always brings out the flavour of cocoa. These chocolate tiramisu pancakes with the most perfect complementary cream were born. 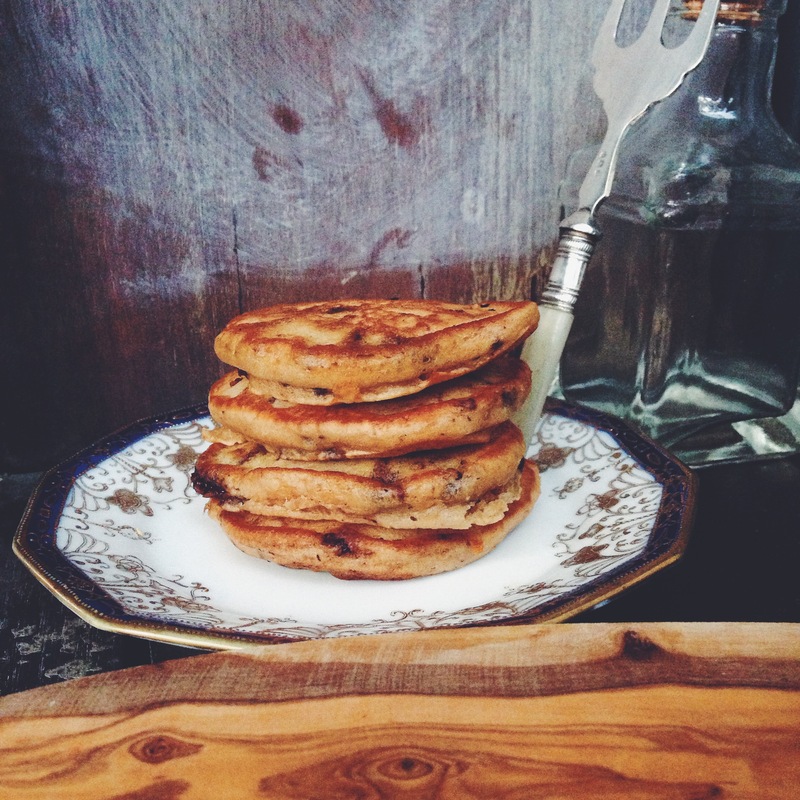 If my honey and vanilla buttermilk pancakes are the fluffiest, then these are the most tender. After a little more flavour experimentation, and the proportions seemed just about right, I could sit down one Sunday morning and indulge in a mini stack. Indeed, that morning was made all the more fine. 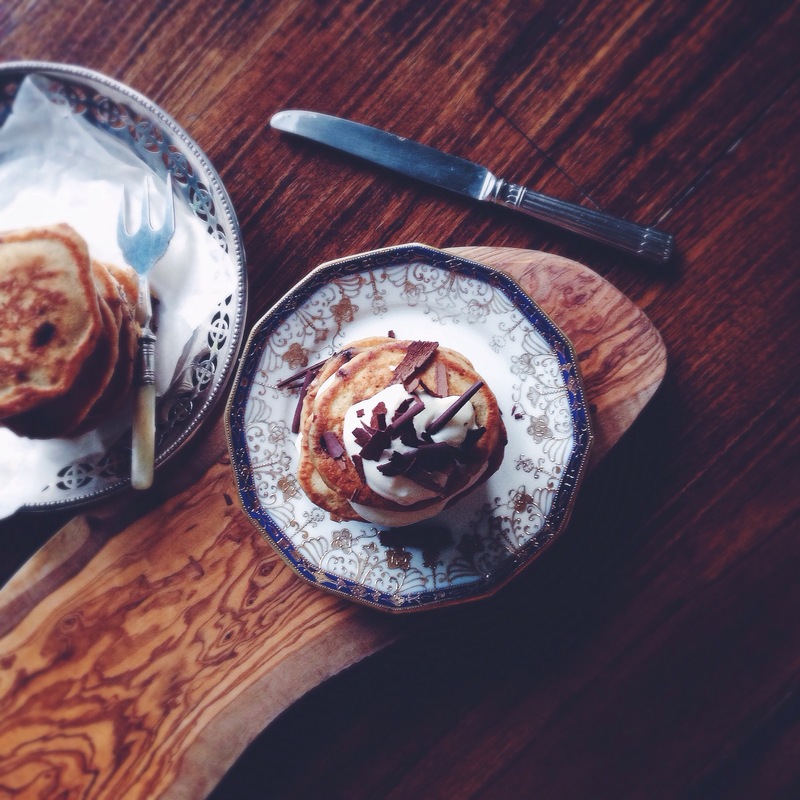 I would think the highlight of everything is the tenderness of the baby pancakes studded with chopped chocolate, with the most divine mascarpone lemon curd cream stuffed between each little pancake. I love those moments when you cut in with your fork and the prongs are smothered in gooey bits of chocolate. You’ll get the subtle hint of coffee. Ok, I know lemon curd isn’t really on the tiramisu ingredient checklist, but trust me on this one. You will adore this delightful amalgamation of sweet and tangy and creamy. In a large bowl, whisk together the dry ingredients– flour, sugar, salt, chopped chocolate and leavening agents. In a small microwave-safe bowl, melt the butter in a microwave and set it aside, letting it cool. In another medium bowl, whisk together the egg, buttermilk, espresso and honey. Pour the wet mix into the dry mix and mix briefly with a wooden spoon. Before it’s all combined, pour in the melted butter. Continue to mix until everything is justt combined, which means there will still be a few lumps, but no more streaks of flour. The batter should be of medium-thick consistency. Preheat your pan or griddle on medium heat and ready some butter. You know the pan is hot enough when you flick a little water onto its surface and there’s a clear sizzle. At that point, generously butter the pan and ladle tablespoonfuls of batter into the pan. Once you see a few bubbles, take a spatula and give every pancake a flip. The next side always takes much shorter; less than a minute or so. Once the second sides are done, let cool on a paper towel or in a warm oven. These freeze well, so you can make a whole batch, have one or a couple and stash the rest in a ziploc bag in the freezer. The cream!! In other words, the super moreish bit. In a small bowl, whisk together all the ingredients needed for the cream with a fork. This makes enough for half the number of pancakes in total, so adjust proportions accordingly. Leftover cream can be stored in the fridge. To serve, place a small pancake on a plate, dollop on some of the cream, then place another pancake on top. Repeat until you have a mini stack of 2 or 3. Top with more cream or maple syrup if you wish, and more chopped chocolate. OK. Now for the fun bit. When eating, try dunking your pancake in iced coffee for the full tiramisu effect. 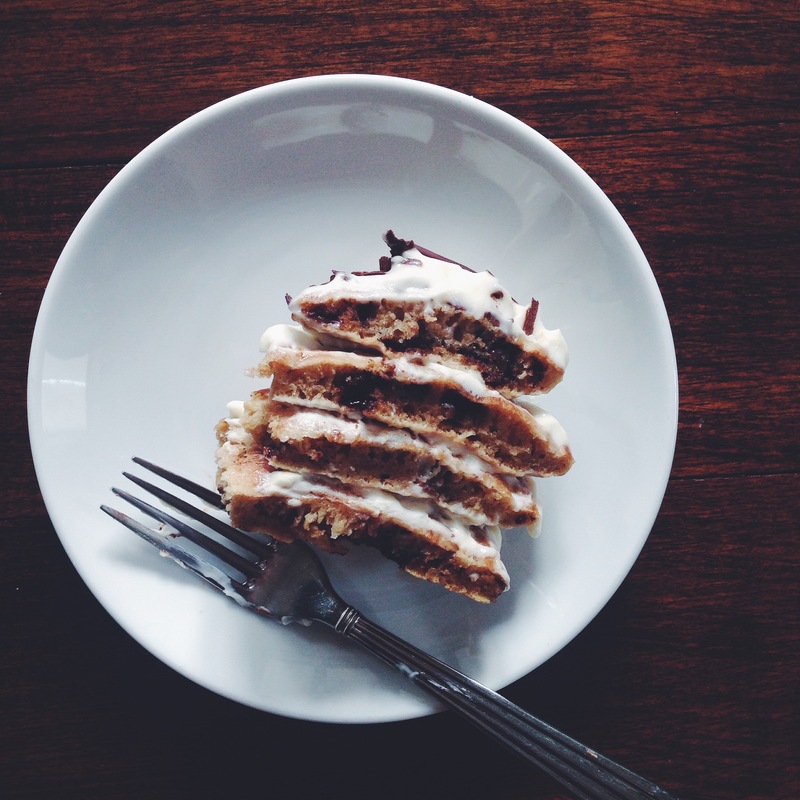 This is the way to eat your tiramisu pancakes. The pancakes are the lady fingers, and they need that little soak. So get to work. Dessert for breakfast. You will feel so proud.